A Place to Grow was specially selected for inclusion in the new Learn, Grow, Eat & GO! (LGEG) curriculum project of the International Junior Master Gardener® Program. This innovative research and evidence-based program grows good kids through an interdisciplinary curriculum combining academic achievement, gardening, nutrient-dense food experiences, physical activity, and school and family engagement. Drumroll please...The Drummer Who Lost His Beat is being published in Korean by Publisher Korea Hermann Hesse! Always follow the beat in your heart and rock on! A Place to Grow interactive reading and learning app was featured at the 2014 Digital Children's Book Fair in Tokyo! Selected exhibitors participated from around the globe! Fun Educational Apps selected the newly released A Place to Grow - Interactive Children's Book as a TOP PICK! Click here to read the fantastic review, which enthusiastically recommends the app! BestAppsForKids.org, an exceptional organization dedicated to helping kids stay safe and thrive, selected the A Place to Grow - Interactive Children's Book as their app of the week! Click here to read the terrific review and watch featured videos for this "must have app!" 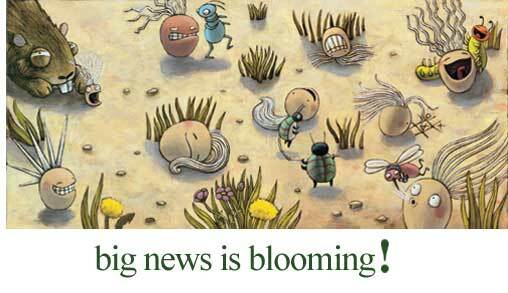 Bloom & Grow is excited to announce that the new A Place to Grow interactive reading and learning app for iPad, iPhone and iPod touch has officially sprouted! Click here to download the app now and enjoy the tiny seed's inspiring journey! The award winning A Place to Grow® celebrated its 10 year anniversary! Time sure flies and so does the tiny seed! Metro Family Magazine reviewed and recommended A Place to Grow for its quality editorial supporting family relationships. AG DAY LA 2009 welcomed A Place to Grow author Stephanie Bloom and Tiny the Seed to its hands-on educational celebration of California's number one industry - agriculture! One of the hottest tickets in town, The Drummer Who Lost His Beat participated in the Multicultural Motion Picture Association’s (MMPA’s) annual Oscar® week luncheon where Academy Award nominees past and present will be celebrating the talents of young Hollywood's budding filmmakers. The story of Bloom & Grow founder Stephanie Bloom is featured in the second book of Bob and Melinda Blanchard's best selling Live What You Love series called Changing Your Course: The Three-Step Guide to Getting the Life You Want. Bloom & Grow made a sizeable book donation to Room to Read®, an innovative award-winning organization passionately dedicated to providing educational access to 10 million children in the developing world - get involved! A Place to Grow was invited by the Smithsonian Institute's Horticultural Division to participate in the very first Garden Fest celebration for children and adults on May 19, 2007! Bloom & Grow Books Joined the 8th Annual CUN Academy Awards Celebration hosted by Billboard Magazine and Children Uniting Nations. The Drummer Who Lost His Beat was featured in the story mode of Sony's best selling PlayStation series "NBA: The Life!" It was "A Starry Night" for Honoree Los Angeles Mayor Antonio Villaraigosa at the 2006 Grammy Foundation® Leadership Award Gala where The Drummer Who Lost His Beat joined the celebration. At the MusiCares® Gala Tribute honoring James Taylor as the 2006 Person of the Year, The Drummer Who Lost His Beat was right on step! Juvenile Diabetes Foundation - Incredible gift bags featuring Bloom & Grow books were given out at High Hopes Tribute Dinner. 2005 Emmy Awards - Jewels and Pinstripes gift bags at the EXTRA Awards Lounge included Bloom & Grow books! Galleria at Pittsburgh Mills hosts a four-day celebration unveiling the latest A Place to Grow® play area! The Birmingham Times reviews The Drummer Who Lost His Beat - "A must read for the young and old..."
A Place to Grow received the prestigious Growing Good Kids - Excellence in Children's Literature Award! The Chicago Tribune featured author Stephanie Bloom in an article about answering the call to write for kids. The Drummer Who Lost His Beat premiered at the 21st annual Chicago Tribune Printers Row Book Fair! Sawgrass Mills Mall - A Place to Grow author welcomed kids at the debut of a new play area. Children found a place to grow in the new play area at Sawgrass Mills! The Mills Corporation opened Cincinnati Mills, the region's premier shopping and entertainment destination. Author Stephanie Bloom was a featured reader, along with Julie Andrews and Jules Feifer, at the 20th annual Chicago Tribune Printers Row Book Fair. Parenthood.com picked Discover Mills® and A Place to Grow® as a Kids Atlanta 2003 Family Favorite Award! The Mills Corporation opened St. Louis Mills, Missouri's premier shopping and entertainment destination. A Place to Grow® at St. Louis Mills on November 13th! St. Louis Kids Find A Place to Grow®! Arthur Frommer's Budget Travel Magazine featured The Mills and A Place to Grow®. Education Update strongly recommends A Place to Grow to parents and librarians! Habitat for Humanity completed construction on special A Place to Grow® House in Atlanta. www.placetogrow.com won an Omni Intermedia Award for outstanding kid's site. Landscape anchors mall's new look. A Place to Grow® and play - Discover Mills partnered with public library. The Mills Corporation and singer Amy Grant celebrated A Place to Grow®! Children find A Place to Grow® at Discover Mills! A Place to Grow® sprouts at Discover Mills!